Smooth Grid - Responsive Blogger Template! After a long time now we're sharing another professional blogger template. Smooth Grid is a high-quality, minimalist and clean blogger template. You can use this template for any kind of modern blog. 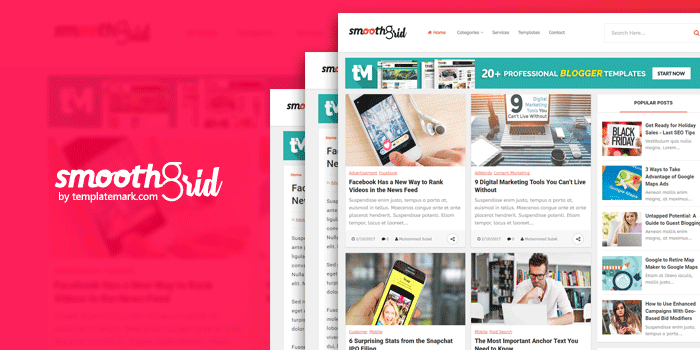 Smooth Grid a SEO friendly, responsive design and fast loading blogger template. Smooth Grid blogger template is a fully SEO and Responsive designed blogger template. You can use this awesome template for any kind of modern blog. Smooth Grid is minimalist and clean blogger template with lots of features. In this template, we first time used a sticky subscribe box widget. Wow.. well good Blog . You know about all simple responsive blogger template. It is so good to learn something from your Blogs Sir.